Sorry, this is a little late in the evening for a few of our readers. I was out celebrating my belated birthday with a few friends (who happen to be my childrens old ABA’s. Sad or awesome?). So, I am finally getting around to this post. Awesome, huh? I decdied that Hubs needed to make this for me. And he did. Did it look like the photo? Um, no! A profession chef made that and probably did some great food camera photo magic. 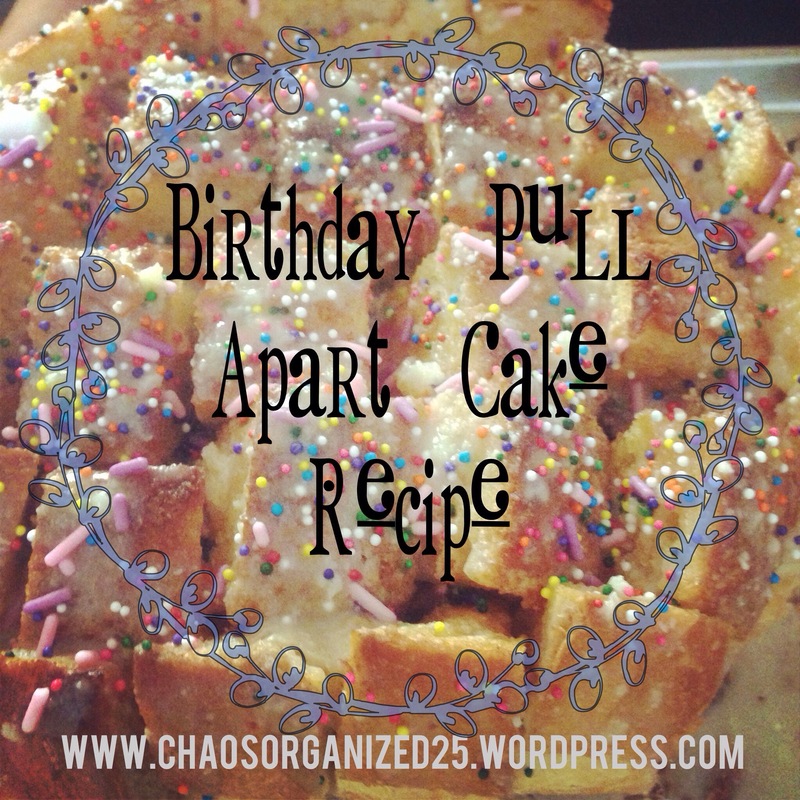 Did I have to make my own birthday cake? NO, and that was the best part. However, the cake was undeniably delectable and the kids ate it. This recipe is so simple and rediculously delicious! Slice bread to make 1/2-1 inch sections slicing almost all the way to the bottom of the loaf. Be careful not to cut too far or to cut through. I used a serrated knife and cut on inch slices all the way down the width way of the loaf. Then I used my kitchen sheers to snip the 1/2-1 inch sections on each row, just to avoid any of them tearing off. Place loaf on cookie sheet. In a small bowl, combine brown sugar, yellow cake mix and cinnamon. Stir to evenly mix together. Set aside. Evenly pour and distribute melted butter between each of the sections, making sure to get in-between each one. Trust me, you want the buttery goodness 🙂 If you need more butter, simply melt as much more as needed. Evenly sprinkle/pour sugar/cake mix mixture between each of the sections. Rub in to cover them if necessary. Be care not to tear any of the sections. 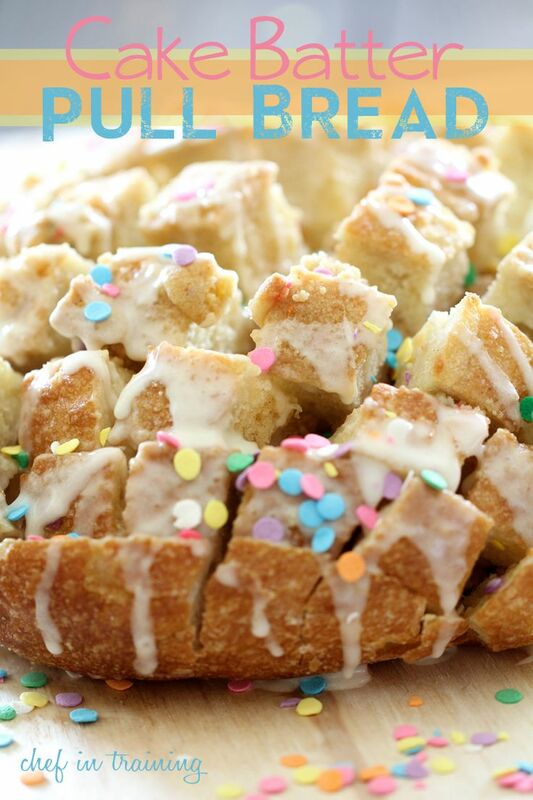 While Cake Batter Pull Bread is baking, make the glaze. Combine all ingredients in a medium bowl and beat until smooth. Add more powdered sugar/milk as needed to reach desired consistency. Drizzle as much as desired over warm bread. Sprinkle with some added sprinkles if desired. Serve warm. This entry was posted in Foodie Fridays and tagged Birthday, birthday cake, bread, cake, cake batter, carb overload, chef, first timer, foodie, Friday, getting old, good, goodnes, new recipe, non traditional, Recipe, who cares, yummy. Bookmark the permalink. Thanks for sharing!! I would really like to try this!